It isn’t called “free planning tool” for nothing. All you need are some basic things which you use in everyday work life, and a Scrum Master to teach you the method. 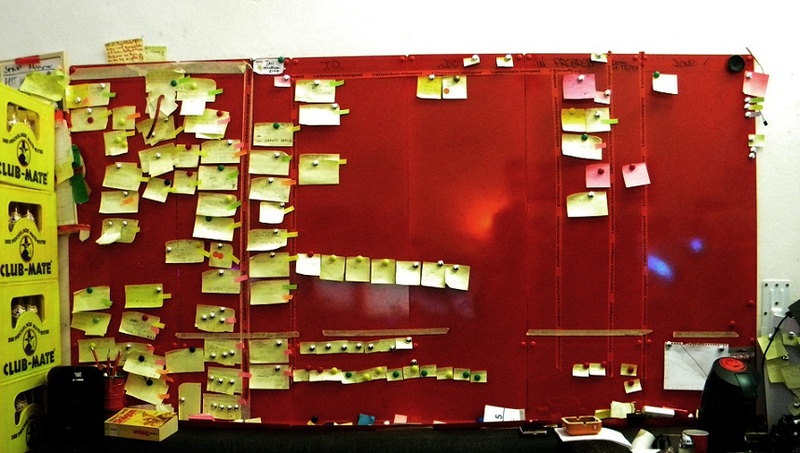 To go agile, you have to set up a Scrum Board first. It is the heart of modern planning and monitoring and the first step to better performance and success. Planning and shipping of complex tasks and products is always visualized on the board. This agile planning board has to stand in a noticeable place, so everyone can see what is going on right now. The Scrum Board has to be a relatively large Pin or magnetic wall - the larger the team and more complex tasks, the bigger the board. Done (not tested) - Tasks which you think are done, so they are marked to be ready to be tested by the Scrum Master at the Daily Scrum. DONE (tested) - Here are the final tasks related to the decrease in the Daily Scrum and for the final acceptance in the Sprint Review. You need Post-it notes for stories and tasks, pins are for keeping the sticky notes on the wall and also to classify the Stories and Tasks. The scotch tape is for separating the Scrum Board sections. The Scrum Master is needed to teach and run the agile project management.